Peru boasts a diverse landscape spanning 1500 miles of endless Pacific coastline, subterranean jungles of the Amazon, and the magnificent Andes mountains featuring the Inca Trail which leads to the citadel of Machu Picchu in the Cuzco cloud forest. Visitors to this beautiful South American country will also experience culinary delights not found anywhere else in the world. Historic sites transport visitors back thousands of years to the ancient Incan civilization and the Spanish conquest of the 1500’s. Pack your hiking shoes, a good camera and plenty of memory discs and prepare to encounter countless photographic opportunities while traversing Peru’s awe-inspiring geography and multifarious terrain. The Peruvian people are passionate about their indigenous cuisine. While Peruvian food consists primarily of maize (corn) dishes, rice, eggs, soups and stews, most of Peru’s 25 regions are also recognized for specific flavors and dishes. 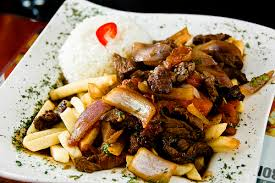 Lomo Saltado – This is a very popular dish made with strips of steak which are sautéed in a blend of soy sauce, garlic, vinegar, onions, chilies, and tomatoes. The flavorful mixture is often placed on a bed of lettuce and served with chips (French fries). Peruvian Ceviche – This beloved Peruvian dish is prepared with bites of fresh, raw white fish which have been marinated and ‘cooked’ in the acidity of lemon and lime juice, and blended with onions, Peruvian spices and chilies. 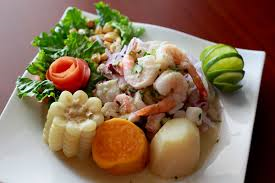 Ceviche is served in a variety of ways, often alongside corn or boiled sweet potatoes. 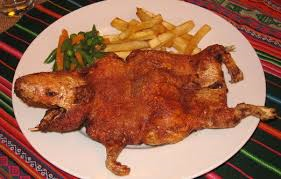 Cuy – If you or your children have ever owned a pet guinea pig, you would perhaps choose to skip this dish. Cuy is the Peruvian translation for guinea pig. The Andean culture of Peru, Ecuador and other South American countries often raise the these animals in their homes; Cuy are considered an important part of the country’s food supply. 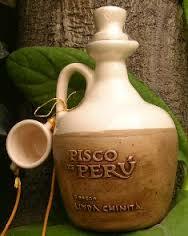 Pisco – This high-proof brandy is a favorite Peruvian alcoholic beverage. Often made in the wine-producing regions of Peru and Chile, Pisco is frequently mixed in cocktails such as an Algarrobina, Chicano de Pisco, or a Cupid’s Cup. A favorite beer among Peruvians is Cusqueña Premium Peruvian beer which is primarily produced in the town of Sacha near Arequipa, Peru. From the primeval Amazon Rain Forest to Machu Picchou, an ancient Incan city in the rugged Andes mountain range, to the narrow, arid plains lining the Pacific coastal region, Peru’s terrain is as diverse and interesting as the country’s ethnic and social demography. Machu Picchou – Peru’s most prominent attraction is Machu Picchou, a spectacular ancient city of the Incas which remained undiscovered by invading Spaniards in the 1500’s. This urban creation located in the Amazon Basin is a magnificent maze of giant walls, ramps and terraces. 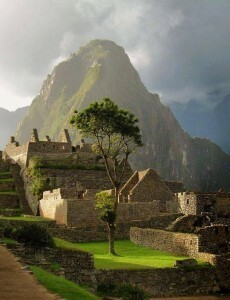 Machu Piccho is a UNESCO World Heritage site, and is listed as one of the New7 Wonders of the World. It is recommended to visit this ancient city early in the morning in order to capture premium photographs without the tourist throngs. Visitors can readily hire a guide at the entrance to enhance their grand and acquire historic and cultural facts on the city. 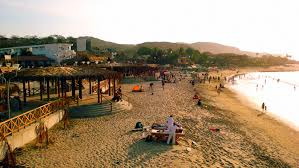 Mancora – A popular site for surfing lovers, Mancora is located on the north coast in Peru’s Piura Region and is considered the country’s trendiest beach. 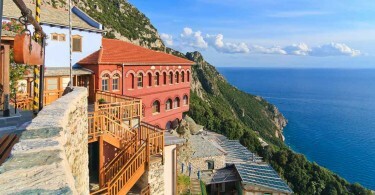 With over 30 resorts and numerous restaurants and nightclubs, this town of only 10,000 residents attracts thousands of sun worshippers, travelers and surfers each year. Nazca Desert and Nazca Lines – This amazing series of immense line drawings was created between 200 BC and 700 AD. 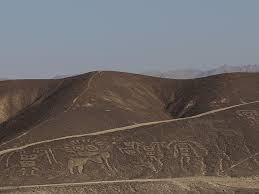 Located between Nazca and Palpa on the north coast, the drawings feature monkeys, fish, llamas, lizards, and humans. The observation tower along the Pan-American Highway provides visitors with an incredible view of three of the figures. The ideal way to see and photograph the lines is via one a Cessna Flight Tour, which can be booked at your hotel. The Sacred Valley – Located in the beautiful yet daunting foothills of the Rio Urubamba Valley, the Sacred Valley is replete with ancient villages and historic lore. Located in the Cusco region near Machu Picchu, it was the primary area for corn (maize) production, and was once considered the heartland of the Inca Empire. 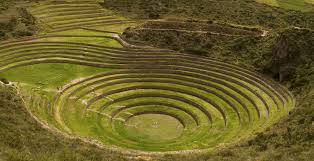 Archaeology lovers do not want to miss a tour of the Sacred Valley. With a history of civilizations that spans thousands of years, the Peruvian people have fastidiously preserved the cultural and geographic diversity which make this country so fascinating. Cobblestone streets designed by the Spanish Conquistadors have been protected and preserved for the future. 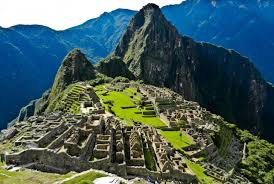 The ancient city of Machu Pichu reminds travelers of the impenetrable Inca Empire. The mystical lines found in the Nazca Desert remain unexplained today. While Spanish is Peru’s primary language, the traditional dialect of Quechua is still utilized by the highland Indians of the Andes. And lying just outside of Puerto Maldonado in eastern Peru, the primeval habitats and natural resources found within in the subterranean jungles of the Amazon maintain an unrivaled biodiversity. In the words of J.R.R. Tolkien, “not all those who wander are lost.” Peru truly is a magnificent travel destination for the wanderlust and those seeking diverse culture, rich history and stunning natural beauty in their travels. For complete information, please visit Peru’s official travel and tourism portal.